The particular axe that I am looking at is stamped PENNIMAN&BROTHER BALTIMORE, and was probably made ca. 1830-50. When I am working with my collection of old tools, especially the timber framing chisels and broadaxes, there is a recurring sense that energy from their makers and past users has left an imprint, as though the tools themselves have memory. Heat and Hammer, quench and temper, the work of a day forged an axe which would last for generations. Every hammer blow, shaping and arranging molecules of carbide and iron, captured some energy from the smith. The knowledge and skill which made the iron and steel, hammer and anvil, goes back to Sheffield and beyond. 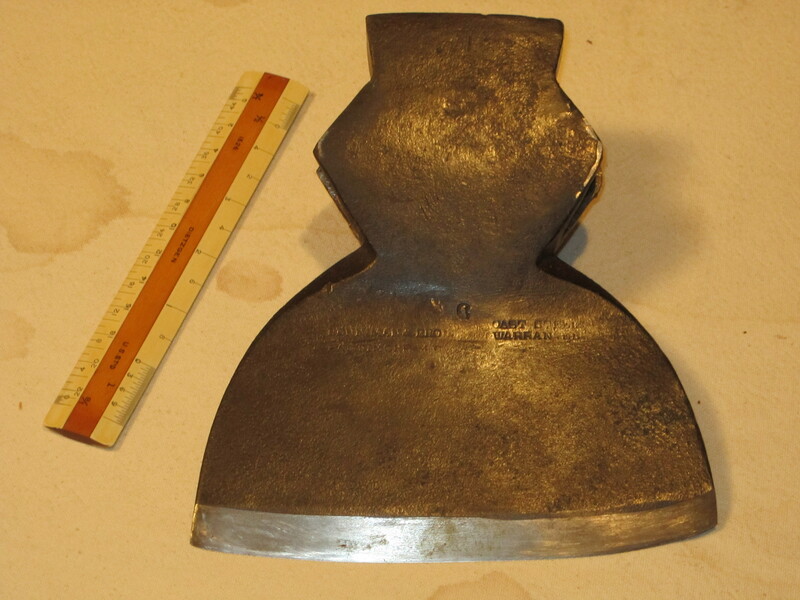 The anvil was most likely a Peter Wright or an Armitage Mousehole; forge, hammer and tongs made by the blacksmith. Legend attributes the development of CAST STEEL to Benjamin Huntsman in the 18th century, but the German bladesmiths who were brought to Hounslow by Charles I might have contributed some apocryphal knowledge to Huntsman. I’m just making an educated guess, history doesn’t tell us much. My axe, a fairly common Kent pattern, would have been a standard tool for a carpenter of the era in which it was made. Common, but there are centuries of development behind it, axes made by countless generations of blacksmiths, and used and used up by countless generations of carpenters. In 1638, Edward Langford was a head-right of William Morgan, who transported twelve persons to Virginia, and received a grant of 600 acres on the Chickahominy River near Jamestown. Since most of the early colonial records of Virginia have been lost or destroyed, further evidence of Edward’s life has not come to light. However, by 1671, a Thomas Langford was recorded in nearby New Kent County. His son Thomas Jr., and grandson Nicholas Langford Sr., who appears in Essex County. By 1732, Nicholas was in Caroline County, where a judgement for £3, 5s was granted against him. Nicholas’ broad-axe was seized and sold to satisfy the judgement. James Langford, probably a grandson of Nicholas’, lost a court case in Caroline County in 1742. James couldn’t or wouldn’t pay the fine, so his broad-axe and iron wedge were seized and sold in settlement. In 1745, Benjamin Langford, Nicholas’ son appears on the list of “Poor Debtors Who Surrendered Their Property and Took the Pauper’s Oath in Caroline County”. Benjamin had a son, Thomas, who was a deputy sheriff in Pittsylvania County. Thomas was killed in 1787 when he fell from a horse. So far, my ancestors hadn’t prospered in Virginia. Meanwhile, back in merry olde England, according to J.D. Aylward, The Small Sword in England, Nicholas Langford–in 1740, was listed as “Haberdasher of Hats & Sword-Cutler at ye Angel & Oxford Arms near Salisbury Court in Fleet Street, London. Thomas Langford–1768-93, was listed as “Hatter & Sword-Cutler, 50 Fleet Street, London. Coincidence? There is evidence that Nicholas Langford of Virginia, of the £3,5s broad-axe, was my ancestor, six generations back. I cannot say with certainty, nor is it likely that the PENNIMAN axe was Nicholas’, since it was made a century later. I am certain that I have an axe; and fairly certain that Nicholas had an axe. Do I then have my great…grandfather’s axe? Weapon shapely, naked, wan, Head from the mother’s bowels drawn, Wooded flesh and metal bone, limb only one and lip only one, Gray-blue leaf by red heat grown, helve produced from a little seed sown, Resting the grass amid and upon, To be lean’d and to lean on. This entry was posted in traditional building and tagged Benjamin Huntsman, Hounslow, PENNIMAN, Sheffield, Timber framing. Bookmark the permalink. That is a great story Michael.